While other Maple Scholars worked hard on presentations and experiments, Bryce Yoder, a junior, sat around playing video games. Specifically, Yoder played a video game he created as part of the Maple Scholars program, an eight-week, hands-on interdisciplinary summer research program that encourages applicants from every discipline to participate. With Maple Scholars, faculty members propose their research topic or creative project in early December, after which students apply to work on the projects. Yoder worked under Randy Horst, professor of art. Yoder, who is a computer science major and a graphic design minor, said that his job this summer was to work through and find possible resources for a new minor at GC: game design. This is where the idea for “Squirrelly: A GC Odyssey” was born; a good way to understand what would be needed in a game design major As a squirrel on Goshen College campus, players try to pick up as many acorns as they can while dodging a golf cart from the science and AD building all the way to Schrock Plaza. Compared to making a 2D platform scrolling game, 3D creation takes a lot more time to make. Blender is a free and open source 3D creation suite that allows people to create and use 3D animations. Unity is a game design program “like Photoshop, except for 3D animation instead of photos,” said Yoder. 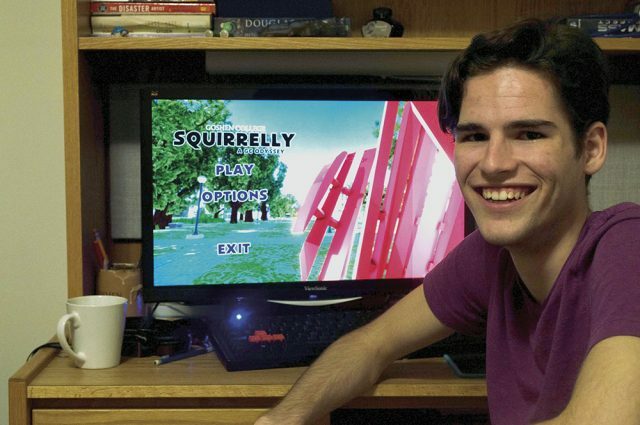 The first creation of the game map for Squirrelly was the “Broken Shield.” After making the sculpture, Bryce said he was then inspired to see how much more of the campus he could make. Even though creating this game took a large amount of Yoder’s summer, there are a few things he is looking forward to adding to the game. He also plans to add some changes to the background of the game. “I want there to be a train that goes by in the background between where the science building is and the residence halls, as well moving traffic on the street,” he said. The background music to the game is live streamed from 91.1 FM The Globe. You can see the name of the artist playing and the name of the track on the screen as you play. So not only do you get to run around the campus collecting acorns, but you can do it to the sound of our very own radio station! “Squirrelly” will soon be available to be played by the public on Yoder’s website: bryceyoder.com.